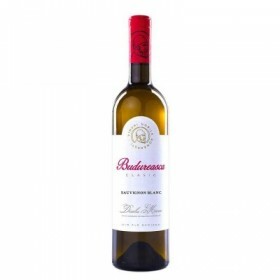 Domeniul Coroanei Segarcea, gama Elite, Chardonnay, vin alb, vin sec, vin din struguri din podgoria Segarcea. Area has 35 acres of Chardonnay planted at a density of 6,000 plants per hectare. Plants have an arrangement from north to south on a calcareous chernozem soil type. Chardonnay grapes, reached a level of maturity 222G sugar / liter of wine were hand picked, they were pressured desciorchinat and low pressure. The wort thus obtained was subjected to natural temperature clarification 5-8 ° C for 48 hours. There followed a slow fermentation in stainless steel vats with controlled temperature between 16-18 ° C for 20 days. To remain with remaining sugar fermentation stopped by filtration. • NOTE smell and taste: Nas fine, delicate fruit notes. Attack round, balanced, gentle impression of peach and apricot pulp. Final gentle grainless.